Management is looking to sell the historic Hotel Durant located at 2600 Durant Ave.
Berkeley’s historical and esteemed Hotel Durant was put up for sale this week, but management does not anticipate any major changes to the building’s unique design. 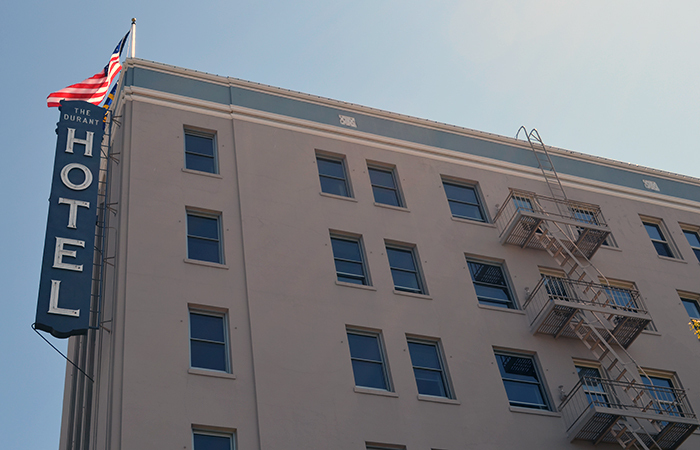 For more than 80 years, the celebrated Spanish-design Berkeley hotel located at 2600 Durant Ave. has been serving guests such as business executives, tourists, UC Berkeley alumni and parents visiting the city and campus. The lending firm that owns the hotel has hired HVS Capital Corp. — an investment banking company that specializes in selling hospitality industries — to sell the historical property, according to Brian Holstein, HVS Capital Corp. vice president. Designed by William Weeks, a Bay Area architect, the hotel first opened in 1928 and was named after Henry Durant, the first president of the University of California and a former mayor of Oakland. The hotel became an instant success and has expanded from 80 large guest rooms to 144 guest rooms, with the addition of Henry’s gastropub and restaurant. Erik Weinstein, the hotel’s operations supervisor, said the building tries to emphasize the surrounding city and nearby campus’s colorful history by featuring a poster of “The Graduate” — the 1967 movie that was partly filmed in Berkeley — in each room and decorating the lobby walls with yearbook photos of UC Berkeley students during the 1950s and ’60s. The San Francisco-based Joie de Vivre Hospitality, a company that manages the hotel’s services, renovated Hotel Durant for $7 million in 2008 and made the hotel unique to the Berkeley community of activists and college students. The hotel also became Berkeley’s first green-certified boutique hotel following the renovation, Weinstein said. Weinstein said the hotel has served the countless scholars who come each year to visit the university and many of the artists who have performed at the Hearst Greek Theatre. Weinstein said he hopes that whoever buys the property continues to work with Joie de Vivre Hospitality to support the small company. Holstein said the hotel does not currently have an asking rate or a deadline on the sale, but he expects the buyer will be a Bay Area resident or a group of UC Berkeley alumni who will not make any major changes to the property. Contact Alyssa Neumann at [email protected].